Ibsen is a comic playwright. I hadn’t realized this till I watched the first half of Philip Franks’ production of The Master Builder at Chichester Festival Theatre. It’s a play about man’s urge to realize the unrealisable – to celebrate his own achievements by both building and climbing the highest tower – about arrogance and ambition – and what are these qualities but comic when exposed? Actually, that’s not true. In King Lear, the outcome of man’s arrogance is tragedy; in Titus Andronicus the outcome is horror and fear. So perhaps it is not so much the qualities themselves but the knowingness with which Ibsen portrays the Master Builder’s cupidity that makes the first half comic as the architect busies himself with placating his mistress, concealing his affair from his wife (who knows full well the score) and subjugating Ragnar, his apprentice (the fiancé of his mistress), in order to quell Ragnar’s ambition to strike out on his own. At times it verges on farce; at others, the twists of the plot resemble those of Congreve or Wycherley. Michael Pennington, as the Master Builder, is by turn playful, indignant, arrogant, manipulative, patronising, bullying – and utterly charismatic. He moves as lithely as a cat. Despite the semi-farcical nature of the plot, most of the comedy comes from deft moments of understatement, innuendo and the subtle undercurrents eddying beneath the main action. The only element that lacks subtlety is the use of clunky conversation to reveal back-story – but that is Ibsen’s fault rather than that of the director. David Edgar, who translated the text, comments in his introduction in the programme that he does not in fact speak any Norwegian: “As in a lot of translations by playwrights, this new version is based on a literal translation by someone else, supplemented by consultation of other existing translations.” All writing is a form of interpretation of other texts and experiences; a play in translation, even when the translator does speak the original language of the playwright, is a form of shape-shifting. The interpretation of the translator, of the director, of the actors, of the audience: these are all layers that clothe the original words on the page. Does one more layer really matter? 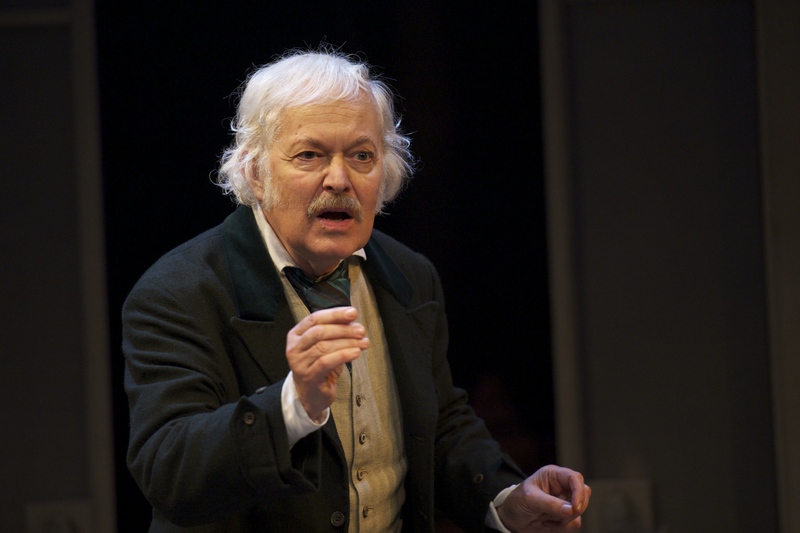 It depends whether you view Ibsen’s original words as the Gospel-truth – or whether you think that translation is more a case of capturing the ‘spirit’ of the original. If one’s view is the former – well, one may as well learn Norwegian and see a production in Oslo. I do not speak Norwegian but, having read other translations aside from Edgar’s, am happy that this version is a sensitive, deft and spirited interpretation or realisation of the original. Certainly the second half has the moodiness and darkness that is more usually associated with Ibsen. The lightness of the first half is gone and, with the appearance of the alarming Hilde, madness sets in. Hilde is youth, she is energy, she is the Master Builder’s desires personified, she is his will – but she attempts to will into being what cannot be. The characters, for all their intertwining motives, exist in fearful isolation. Director Philip Franks’ careful balancing of mood and tone – for this play is all about tone – makes an entrancing performance. The set is elegant and atmospheric (a backdrop of silver birches, the house in the foreground) and well-suited to the intimate space in the Minerva. Go if you get the chance.